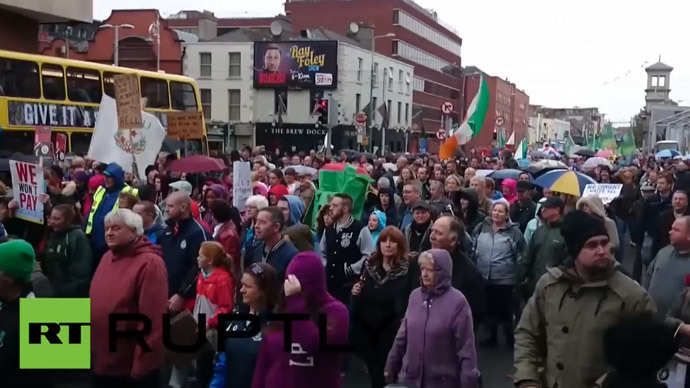 An estimated one hundred thousand people took to the streets of Dublin on Wednesday in protest against the Irish government's planned water charges. Campaigners maintain they are a “regressive” austerity tax that many Irish citizens can't afford to pay. 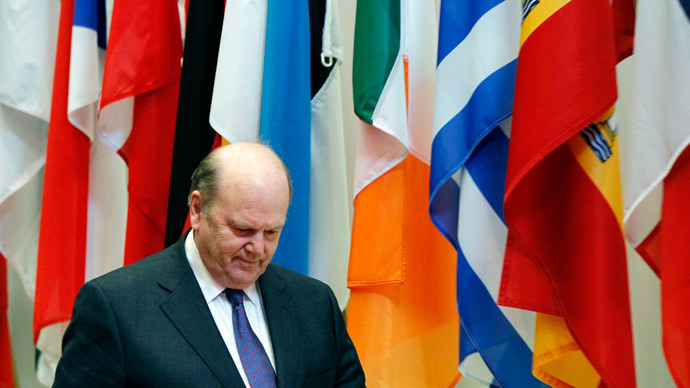 The charges form part of the Irish government’s wider debt re-payment strategy in the wake of a grueling bank bailout that cost Irish citizens in excess of €70 billion. 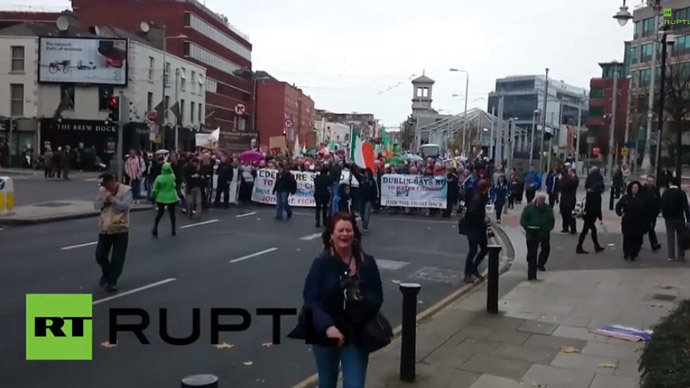 The mass demonstration began at 1pm in Dublin’s Merrion Square, adjacent to Ireland's Government Buildings. The state-owned building is home to Ireland's Department of Finance and Department of Expenditure and Reform. Campaigners from diverse communities across the state marched through Dublin and assembled at Merrion Square, where demonstrators listened to political speeches and musical performances. The protest was organized by Ireland’s Right2Water campaign, a nationwide collective of activists, community groups, political parties, and trade unionists. Right2Water argues the provision of adequately treated water and sanitation is a vital public service, and a fundamental human right recognized by the United Nations (UN). It is calling for the Irish government to legislate accordingly, and abolish its plans to introduce water charges in January 2015. The Dublin-based TD, who represents Ireland’s Anti-Austerity Alliance, warned the benchmark fees were likely to increase in the future, and pave the way for privatization of Ireland’s water services. In a show of global solidarity, campaigners from Detroit and Greece traveled to Dublin to support Irish citizens in their battle against the controversial water tax. As protesters pulsed through Dublin city center on Wednesday, police faced traffic disruptions across the capital. 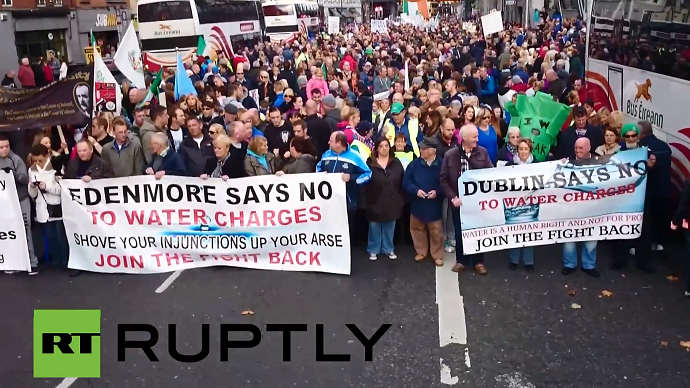 Right2Water suggested more than 100,000 people attended the main rally, while police estimated the number was"30,000 plus." The Irish government's proposed water tax forms part of its long-term plan to repay billions of socialized bank debt, stemming from a banking crisis that brought Ireland's economy to its knees. Following an IMF/EU bailout in 2010 that resulted in years of harsh austerity measures, Ireland's economy is yet to fully recover. As part of its water policy shift, the Irish government set up semi-state firm Irish Water in July 2013. The company is set to begin charging citizens for water usage in January 2015. If implemented, the charges will replace Ireland’s current system of paying for water services through general taxation. The move has proved hugely unpopular, and has been described by campaigners as the most contentious austerity measure imposed on Irish citizens since Ireland’s 2008 economic crash. It has also spawned a vibrant mass movement in its wake. “This is about more than water charges now,” Dublin TD Paul Murphy said. As austerity prevails and unemployment, emigration, poverty, and homelessness remain rife in Ireland, many citizens maintain they cannot afford the water charges. Right2Water warns the coalition's proposed charges amount to “a regressive tax” that will discriminate against ordinary workers and the unemployed who are struggling to make ends meet. The prospect of facing the commodification of water has angered Irish citizens, prompting multiple nationwide demonstrations in recent months. 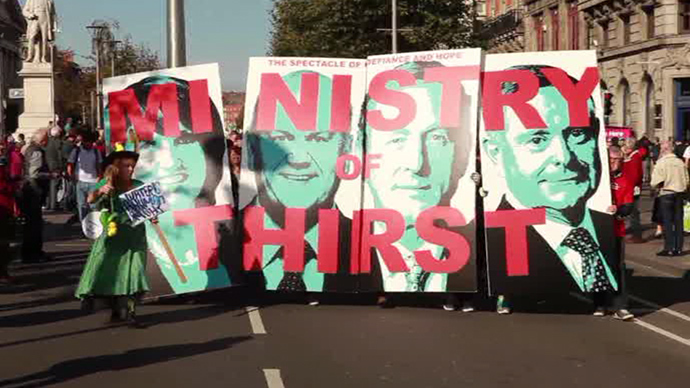 Swathes of Right2Water protests have highlighted what campaigners warn is double taxation on water services. The Irish government has attempted to justify its water tax by suggesting the charges will provide funds for the development of vital water infrastructure. It claims an alternative to the measure would be increased income taxes. But Brendan Ogle, a leading member of Ireland’s Unite union and Right2Water campaigner, argues Irish citizens already pay for the transit and treatment of their water via general taxation. Ireland's Minister of State at the Department of the Environment, Paudie Coffey, said on Wednesday the Irish government would not alter or renege upon its water charges policy. In an effort to defend the Fine Gael-Labour coalition's position, he told Irish state broadcaster RTÉ that the government's water charges would facilitate the creation of much needed funds for the development of the state's water infrastructure. According to the planned water rates, a single-adult household would pay €160 (about $200) per year. The maximum charge for a multi-adult home would be €260 per annum, regardless of the income of its occupants. These rates will remain in place until 2019, after which they could be increased. Dublin-based TD Paul Murphy said TTIP, a controversial EU-US trade agreement currently being negotiated in Brussels, could jeopardize Irish citizens’ fundamental right to water in the future. If the much criticised “Investor State Dispute Settlement” clause remains in the transatlantic trade deal, future Irish governments could be sued by private firms "for not allowing competition” in the supply of vital water services, he warned. This in turn could prompt the privatisation of Irish water. “We believe that water privatisation and water charges are some of the biggest issues facing the people of this country," Jim O’ Connell of Right2Water told the Cork Independent. 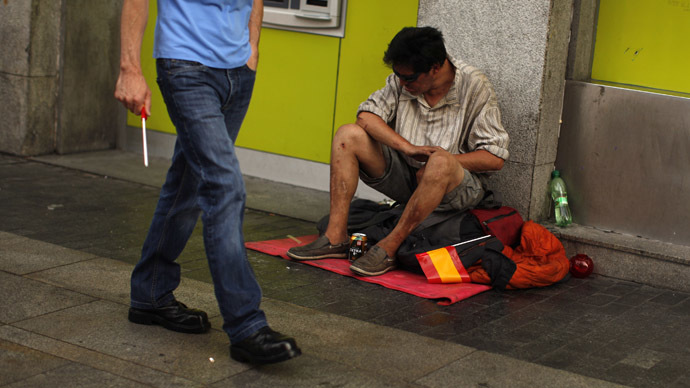 "In the most vulnerable positions are the already hard pressed young families, social welfare recipients, the elderly and the infirm." Among those who attended Right2Water's mass demonstration was a group of activists from US campaign Detroit Water Brigade. The campaign travelled four thousand miles to stand in solidarity with Irish people protesting against government water charges. The volunteer-led collective is working to bring emergency relief to struggling families facing water shut offs in Detroit, Michigan. In July 2013, the city filed the biggest municipal bankruptcy case in American history. It successfully exited bankruptcy on December 11th 2014. Nevertheless, amid dire economic circumstances, some 40 percent of Detroit citizens currently face having their water supply terminated. Addressing crowds at Merrion Square on Wednesday, Detroit Water Brigade told Irish citizens "your fight is our fight." In July 2010, a United Nations (UN) resolution stated citizens' access to “safe and clean drinking water and sanitation” is a human right that is “is essential for the full enjoyment of life."